Last weekend I went on a little trip to a local yarn store. 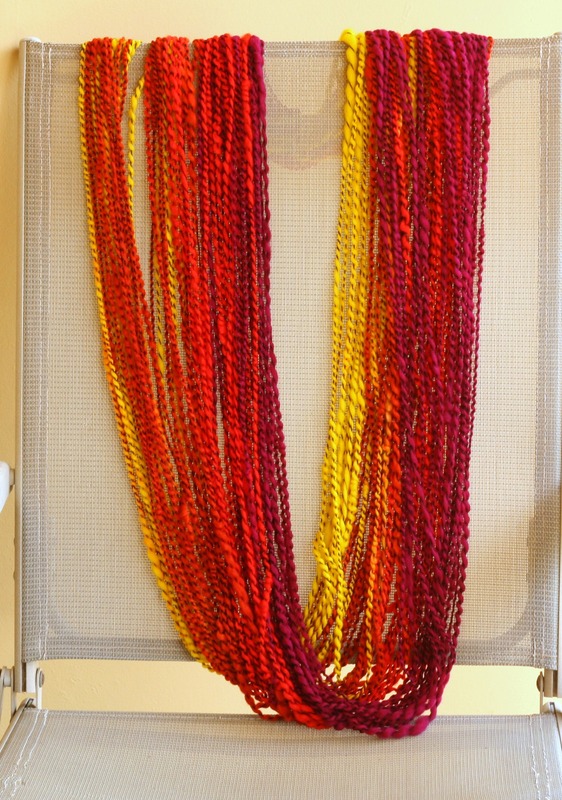 While I was there a braid of very pretty roving forced itself into my hands and bullied me into buying it. What’s a handspinner of yarn to do right? This handpainted roving wanted to become a long colorway yarn. It told me in no uncertain terms that it wanted to be a Noro-like yarn. That meant spinning it as a single ply yarn. So when I found myself buying this roving (against my will) I told myself I’ll spin it as a single and then do the fulling thing. But… then I actually read the label and saw my new roving was 100% superwash. Superwash fibers don’t full (or felt) of course. So I came up with Plan B. Plan B was to spin up my yarn all as one ply but with plenty of twist. Then I’d use a commercial yarn and wrap my handspun around it. That gives me alllllllmost the same effect as a single-ply Noro-clone yarn. Part of the trick to making this work is to hold the commercial yarn straight and under tension. Its already finished and balanced and you don’t want to be adding any twist to it. The second part of this trick is to hold the handspun off to one side, at an angle, and under almost no tension. When you get it right the commercial yarn just feeds onto the bobbin while the handspun wraps itself around the commercial yarn. It makes for a nicely balanced, finished yarn. It will work up in long stretches of color. I don’t have to worry about over-twist. But it is bumpy and what I have is, in essence, a thicker yarn that I would have if it was a simple single ply yarn. And of course you don’t have to wait until you find yourself the involuntary owner of superwash roving to give this technique a try. 14 Comments on "Getting the Yarn I Wanted from the Roving I Had"
The whole process sounds complicated but the finished yarn look heavenly. You have areal gift. Enjoy your yarn and share with us what you turn it into. Thanks! But its not all that complicated. If you can spin, you can make a yarn with this finishing method. So beautiful. You have such a special talent. Can’t wait to see what it becomes. Awesome, Jenn! I’m off to give this a try, using some cheviot roving and one of my treadle wheels, maybe the elderly but always dependable Louet S10. She does thick yarn very easily, as she pulls like a mule. 😉 Love those super hot Texas summer sunset like colors too. They are 100 degrees in the shade. Loved the Texas Rangers history. Help, please! I went back to this post to try to solve my problem, but my problem is bigger than that. 😰. I spun a ton of alpaca with plenty of twist, planning to ply. Change of mind. Now I want to add mohair fiber and locks to it to make a lumpy bumpy yarn. Is there a way I can add the mohair to the alpaca single, perhaps with a “thread that binds”? Or am I destined to try to spin a mohair single and ply the two? Revisionist planning leads to trouble! Then maybe you can’t combine the mohair with what you have. Because now I’m hearing “core tailspinning” form what you describe. 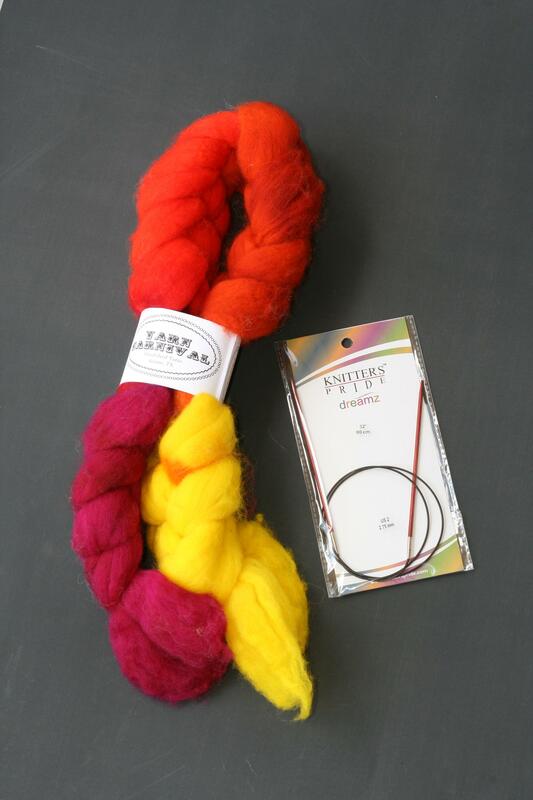 For that you need a spun core yarn and individual mohair locks. Susan Anderson also has a chapter on tailspinning (yes I do love her book). Those mohair locks do not get combed but they do get flicked. Just to open them up. Bingo. I think we have a winner! Many, many thanks. Oh good. Let me know how it turns out. So many questions…Did you plan to ply with the crochet thread from the beginning? And choose to spin S or Z based on the direction the crochet thread was commercially plyed? I guess I’m really wanting to know, what direction did you spin your fiber and what direction was the crochet thread plyed? I did plan it out from the beginning yes. But… I always spin my singles with S twist (turning the wheel clockwise). The thread is already plied and balanced. Its a Z ply but that is not what matters. What matters is that the thread is balanced. That’s why I hold it straight out at almost no tension. I’m not putting any twist in the thread at all. It just feeds into the orifice and onto the bobbin. The spun single is allowed to spiral wrap… treading Z twist… around the thread.